Stunning for a big MPV. Massive inside yet very calm behind the wheel. Reasonably priced and, in higher trim levels, passes for a luxurious experience. Every version has 20-inch wheels: stylish. You’ll need a top-spec car (near enough) for the best infotainment. It’s as involving to drive as its bus-like proportions suggest. Every version has 20-inch wheels: costly. 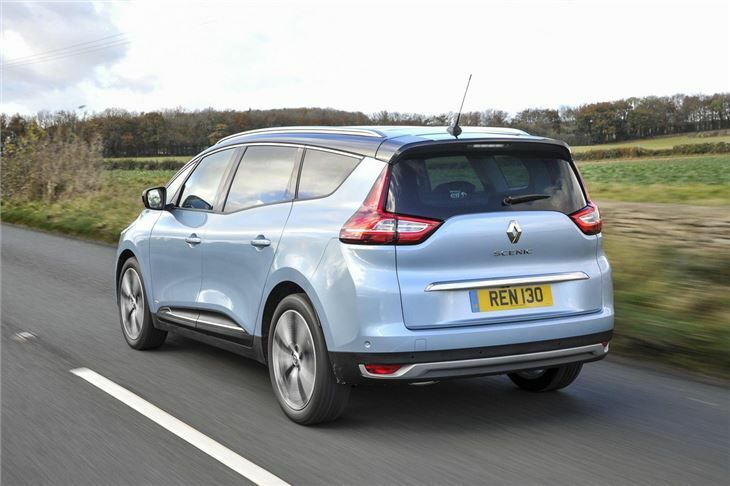 More spacious and luxurious than ever before, the latest Renault Grand Scenic is so vast and practical that Renault isn’t bothering to sell its bigger brother, the Espace, in the UK. To get straight to the point, this is our favourite seven-seat people carrier. 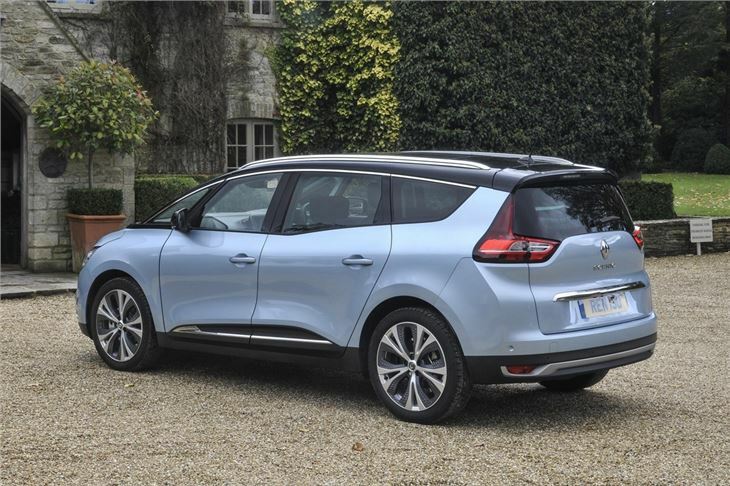 Not only does it have oodles of space, comfort and refinement, but it’s probably the only MPV that looks attractive with no caveats. 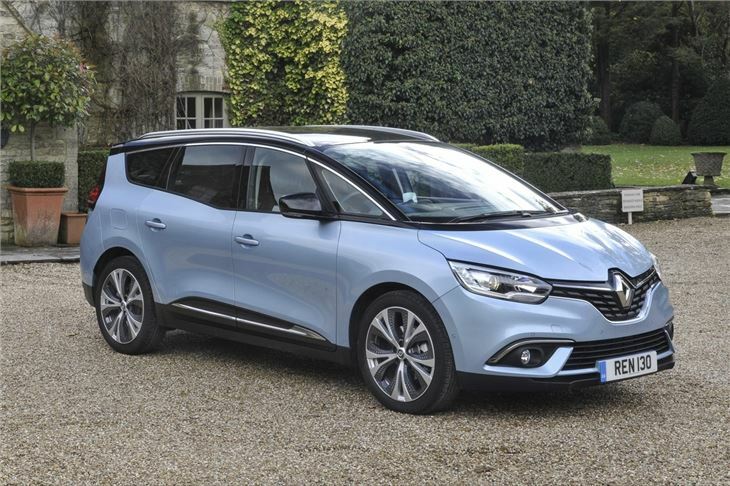 That’s subjective, of course, but to our eyes the Renault Grand Scenic is as stunning as utilitarian people movers come. That’s a bonus, of course – you don’t buy a seven-seat people carrier because you want to look good – but thankfully the styling creates no compromise when it comes to the important stuff. The Grand Scenic is very spacious, has a truly flexible cabin and drives with the sort of relaxed refinement that you’ll only truly appreciate in the context of having three-to-five kids. With no handling benchmark to aspire to - unlike the average large crossover, which requires some semblance of ‘sportiness’ - the Grand Scenic is a big wallowing box. That means on rougher roads it does tend to bounce and bobble a little too much, but generally it glides in a fashion reminiscent of a luxury car. But those rims. 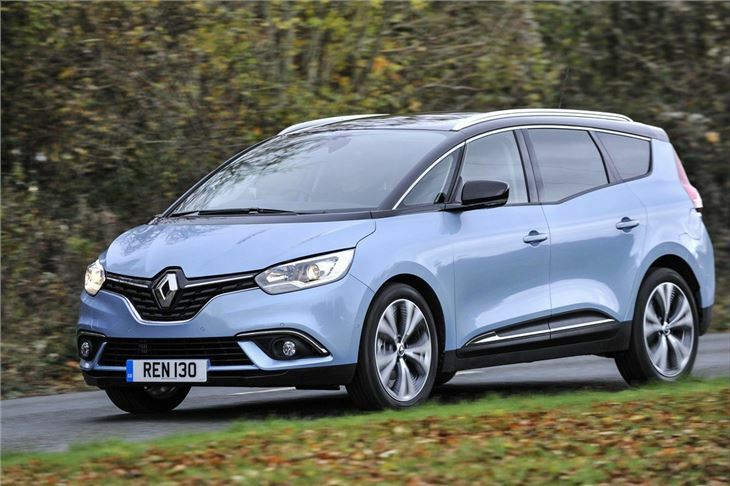 For some reason, possibly aesthetic, Renault has chosen to equip every Grand Scenic with 20-inch wheels – smaller would possibly look pathetic beneath such a vast box. Sure, they have relatively high sidewalls (55), so they don’t upset the ride too much, but they do mean that your tyre replacement choice is limited – ergo, more expensive. 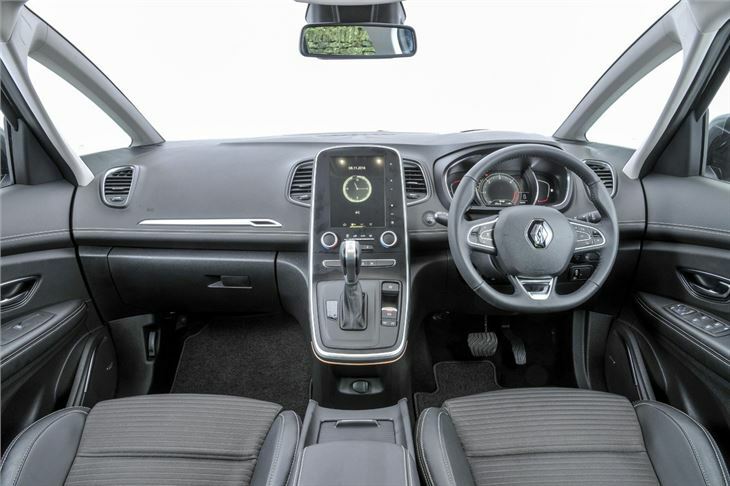 Based on the Renault Megane, the Grand Scenic interior isn’t quite as dedicated to eeking out every last inch of usable space as the Citroen C4 Grand Picasso is, but it’s still all the MPV you’ll need. 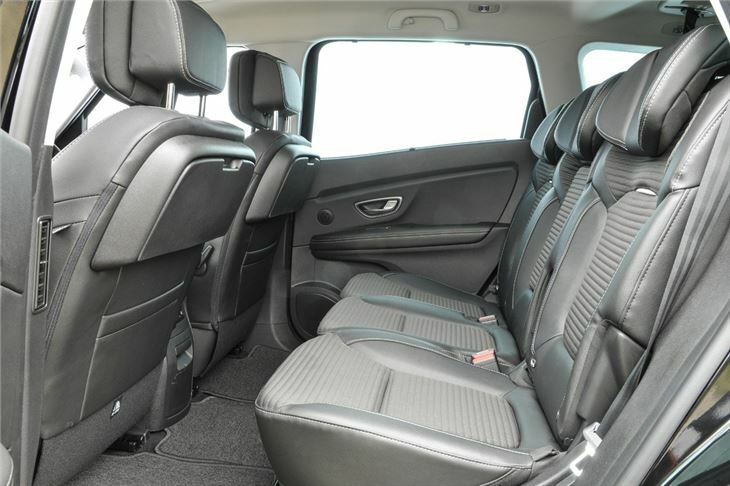 Quality is excellent, the seats both look and feel great while the rearmost pair of chairs offer near enough adult space – you can have the car with just five, if you like. 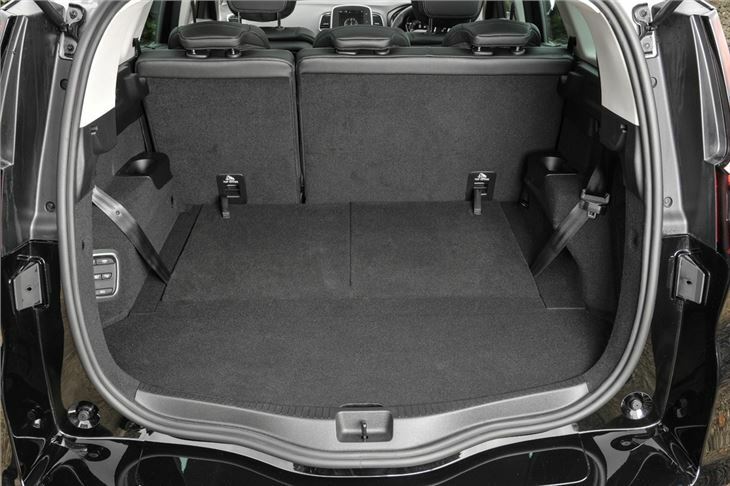 It follows that the boot is huge at 592 litres, but it’s also furnished with a flat loading space. The rear chairs fold completely flat too – and at the touch of a button. A fairly wide range of engines gives you a choice of three diesels and two petrols, as well as a diesel with an electric motor called Hybrid Assist. The diesels come in 110PS, 130PS and 160PS outputs, and the petrols either 115PS or 130PS. As usual it’s a diesel you’ll want, the combination of its superior low down pulling power and fuel efficiency – the pick of the range the 1.6-litre dCi diesel with 130PS, returns more than 65mpg according to the official figures. Priced from around £23,000, the Grand Scenic undercuts the base price of a Ford S-MAX by more than £2000. Ditto the SEAT Alhambra.